Setting up your own Home Photography Studio can seem like a scary and expensive project, but it doesn’t need to be either of those things. With so many tutorials for DIY Photography Studio Equipment to be found online, it’s never been easier to create a DIY Home Photography Studio on a Budget. Or of course, as any photographer knows, you can also easily spend thousands of dollars on top of the range equipment! In the end, the cost of setting up your Home Studio is up to you, the type of photography you do and your budget! To prepare you for setting up your own Home Photography Studio, we’ve put together a short list of equipment needed for a Home Studio in every budget range. While the specific equipment needed for your Home Photography Studio Setup will change depending on the kind of photography you want to do, there are a few fundamentals to start off with. Namely, Studio Lighting, Tripods and Studio Backdrops or Backgrounds. The word photography comes from the Greek words phos, meaning light, and graphé, meaning “drawing”. Photography, at its core, means “drawing with light”, so it makes sense that Lighting is the first thing on our list. While some photographers prefer Natural Light Studios, the vast majority of Photography Studios maintain Artificial Lighting Setups. After all, even the most advanced cameras will be useless in a room without light. Like all things, this can be as simple or as complicated as you like! For the most simple portrait photography lighting setups, for example Loop Lighting, all a studio needs is a speed light and a reflector. For product photography though, a studio setup might involve a light box and two continuous lights placed on either side. While some professional photographers may choose to work without a tripod, this indispensable piece of equipment is a must if you’re going to invest in a Home Photography Studio. Tripods allow you to achieve stable photos regardless of the environment and enable you to maintain composition and exposure while still working. This is especially important for product photographers or studio photographers who need to reproduce similar shots one after the other. The final piece of fundamental Home Photography Studio Equipment is the background or backdrops. One of the most important reasons for using a Studio to make photographs is the ability to have complete control over the environment. Backdrops are a big part of this! The potential options for Studio Backdrops are virtually endless, from Green Screens to simple pieces of card or fabric pinned against a wall. Now you know that the three most important items for your Home Photo Studio are Lighting, Tripods and Photo Backdrops or Backgrounds. But how much should you budget for your Home Photography Studio? The prices and uses of equipment can vary wildly, from a few dollars for a cardboard backdrop to $4,000+ for a moveable background stand. To make things simpler, we’ve put together some ideas for Studio Lighting, Tripods and Studio Backdrops in every budget. 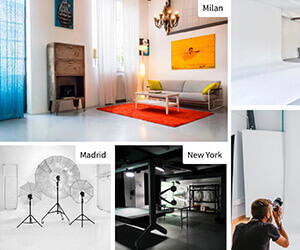 If you’re looking to Set Up a Home Photography Studio, this is the perfect resource for you! #homephotographystudio – having fun shooting products for a new business ? While a natural light studio might seem like the best way to go if you’re setting up a Home Photography Studio on a Budget, it’s likely your home studio space won’t have a north-facing light already built in. With this in mind (and knowing that renovations would likely be far more expensive), we’d recommend the one item you splurge on for your DIY Budget Home Photography Studio be a Speedlight or a Flashgun with a Wireless Flash Trigger. Don’t worry though, by splurge we mean spend between $100-300 on non-name brand equipment, like Godox Thinklites and Wireless Flash Triggers. These two items in and of themselves are enough to give you plenty of options for Studio Light Setups, and the rest of the equipment is fairly easy to DIY. You can DIY a studio lightbox using cardboard boxes and white cloth, a reflector with cardboard and aluminum foil, and a DIY light stand with PVC pipe or just about any stable surface! Choosing the right Studio Lighting with a medium budget will depend on the setups needed for your style of photography. For product photographers, it would make the most sense to invest in a professional light box and a few LED Panel Lights to place on either side. For a portrait photographer, a Lighting Kit like the Impact Fashion Beauty Dish Kit ($403.42) could be the way to go! If you have a mid-range budget for your Home Photography Studio, the best plan of action is to make a list of the most important Studio Lighting Equipment for your style of photography, then prioritize those things. If lighting is your main priority and money is no object, it makes sense to kit your studio out with the best from the very start. Be prepared for any client request or any creative new idea by keeping a wide variety of lighting gear on hand. Perhaps the easiest way to do this is to invest in a Lighting Kit. The Norman 4 “R” Monolight, 3 Softbox Studio Boom Kit ($4,699.00) is a great place to start when kitting out your Home Photography Studio. It includes monolights, light modifiers like softboxes and reflectors, as well as light stands. A kit like this offers versatility and ease, without having to painstakingly choose each individual piece of your lighting kit. Yes, tripods are important when it comes to setting up a Home Photography Studio, but thankfully, they don’t need to be expensive. The obvious way to DIY a tripod is to set your camera up on a steady table or chair. That can be a little inconvenient though, so why not try out one of the internet’s many DIY remedies! Try this video, where you can DIY tripods out of sand-filled bottles, string or even a simple bag of rice! Because a tripod is a piece of equipment you’ll undoubtedly use again and again, we’d recommend moving to the slightly higher side of medium when investing in a tripod. Carbon Fiber is ideal as it’s lightweight and strong, but the tripod itself doesn’t need to be the most advanced piece of technology on the market. The Oben CT-2491 ($299.95), or something within a similar price range, will provide the range of movement and stability a photographer expects from a tripod without breaking the budget. Theoretically, one tripod should be enough for any photography studio. If you have a high budget though, why not make it a tripod that will last you a lifetime! Keeping in mind that the most expensive tripods should probably be left to the realm of adventure photographers heading out onto boiling volcanoes, we recommend a carbon fiber tripod with a ball head. Something like the Induro GIT505XXL Grand Series 5 ($1,209.95) is a great option, as it’s easy to use and extremely versatile. Not to mention the included Gimbal Head will allow you to shoot vertically with ease – a feature that can be vital to getting the right shot! A Studio Backdrop doesn’t need to be fancy! When it comes to photographing small, fixed objects, a homemade soft box could be all you need. For larger objects, you could simply pin a large piece of cardboard or a colored bedsheet against the wall. The benefit of this is that it will be super simple to change the backdrops out whenever you like! If you have a slightly higher budget to invest in your Home Photography Studio Backdrops, we’d recommend investing in something like a curtain rod system. This can be easily converted to hold a number of different Roll Down Photography Backdrops giving you flexibility and the chance to have a beautiful seamless backdrop. If you’re trying to create a slightly more ‘professional’ environment, you could always upgrade to something like the Savage Multiple Polevault System ($217.99), which has room for up to 3 different backdrops, and save money by DIY-ing the backdrops themselves using material or paper rolls. Of course, a backdrop is no use without a Stand! If you know you’ll always be shooting against the same wall, a product like the Foba DODRE Wall Mounted Background Stand ($1,571.70) will be a great solution for you. Swap out your paper backdrops easily and avoid the hassle of setting up and taking down your backdrop. If you’ll be changing positions within the Studio regularly, a movable stand will be worth the extra investment. As much as research can be a great way to learn, sometimes it’s not enough to give you the confidence to make a start. This is especially true of a project that can be as important to your business as setting up a Home Photography Studio! So if you learn best by watching the action instead of just reading about it, why not sign up for an online studio photography setup class? There are plenty to be found! For starters, check out the Intro to Studio Lighting Class that we recommended in our recent article ‘13 Best Online Photography Courses’. Otherwise, check out the many different courses that you can find on the Define School, Creative Live and Skillshare. After all, the internet is useful for so much more than just cute animal videos!